Sally Mauk: Welcome to "Capitol Talk" our weekly political analysis program. I'm Sally Mauk and I'm joined by UM Political Science Professor Rob Saldin. Our colleague Chuck Johnson is still out this week, but we hope to have him back next week. Rob, this seems to be a session attracting several large protests, and one this past week filled the capitol with up to 1,000 supporters of keeping public lands public. There's — it seems to me — not much likelihood that there will be a bill to privatize public lands that will get out of this legislature or past Governor Bullock's veto pen anyway, but it's not an issue that's going away either. 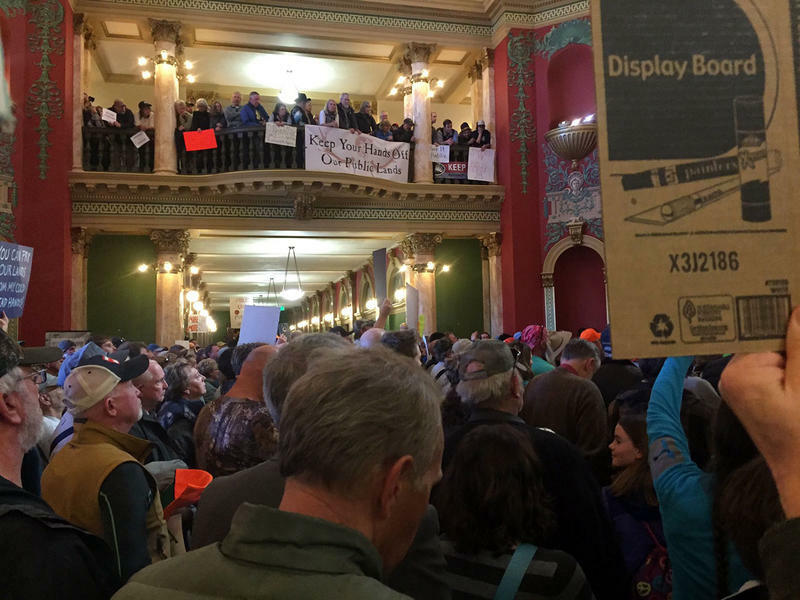 Rob Saldin: That's right, we've seen rallies like this on public lands in all the other previous legislative sessions recently, but his one drew a larger crowd than we've seen in the past. It think big-picture there are a couple ways of looking at it. One is that this was just one piece of a much broader resistance to the Trump administration that started with the women's march and also includes the spontaneous protests at airports last weekend after the immigration and refugee ban was announce, as well as the unprecedented numbers of phone calls that are flooding offices on Capitol Hill concerning a variety of issues. So clearly the public lands rally in Helena as well as a similar event in New Mexico benefited from this larger context. Now to be sure, not all public lands advocates would identify with the broader resistance. And in fact, many of the hook and bullet type conservationists are politically conservative on other issues. But still, the broader context is an important part of the story. Another way of looking at this of course is just within the context of the debate over public land, and hear the broader context, I think, is that the movement to transfer or sell public land has gained a great deal of momentum in recent years. This movement didn't come out of nowhere. In many ways in fact it's a reprise of the so-called sagebrush rebellion of the 1980s. But, there's just no doubt that it's enjoyed a real revival here recently, especially within the Republican party. I think you're right, that the chance of any bills going through the Legislature and becoming law this session are unlikely. At the rally, Gov. Bullock again reiterated his opposition to any of these measures. And I think one of the interesting things we see out of this rally and the larger context is that is points to a real problem for those advocates of transferring or selling public land that's always, in a way, been there, but that now is maybe taking on a greater intensity. We've seen over many years that the public tends to be opposed to these kinds of proposals. Just this week, the annual Colorado College poll of Rocky Mountain states came out. And as usual, that poll indicates very clear and strong support for public land. I think the thing that's been fueling the opposition to public land is a level of intensity among it's supporters. I think what we're seeing now, is maybe that the majority is now sticking up for public land in a way that it hasn't always in the past. SM: And that opposition has been so widespread across the country that a bill in Congress to privatize public land was withdrawn by its Republican sponsor. RS: That's right, Jason Chaffetz of Utah had introduced a bill to sell-off over 3 million acres of federal public land, and he pulled that back and he cited having heard from a number of groups who were opposed to it as well as citizens who were opposed to it. The interesting thing here is that this is not some proposal that he just cooked-up last week and introduced into Congress. This is something that he's introduced in prior Congresses, so this has been around for a long time, and now all of the sudden he just hastily says he's not going to support it any longer. That's a real 180, and it suggests something has changed and clearly he's hearing from people and people are speaking up about this issue in a way that reflects what has always been indicated in public opinion polls, but maybe hasn't been voiced and articulated very clearly. "I know you want to be a Teddy Roosevelt kind of secretary of Interior, but you're working with an administration who in their own infrastructure bill says that they're going to pay for it by oil and gas infrastructure, by oil and gas on federal lands. I don't know where that stops," Cantwell said. SM: Well given the current administration, that's a fair concern by those who do want to make sure that public lands are not developed to the point of being destroyed. RS: Sure. From the Maria Cantwell perspective, there may be two types of errors. The first type is the one that's more drastic: the idea to transfer or sell public lands. And Zinke has clearly said many times he's opposed to that, and his record, for the most part — with a couple notable exceptions — is in line with that. But the other type of concern is exactly what you've talked about; even if we take off the table to the idea of transferring or selling public lands, there's still this issue of what's being done on those lands, and clearly that's a position where Zinke is very much in line with those who are seeking to increase development on public lands. And that's objectionable to a lot of Democrats and conservationists, even those who might appreciate Zinke's commitment to keeping public lands public. "Ryan you possess exactly the right balance, as we say in Montana, we're a blend of George Strait and John Denver, and you get that," Daines said. 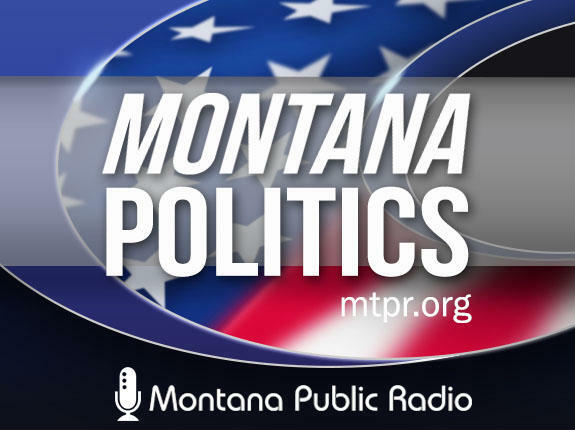 SM: Musical tastes aside, there's no more contentious issue in Montana than how public lands are managed, and now a Montanan will have a very influential voice in that. RS: For sure. You know, the Interior secretary almost always comes from a western state. Zinke's going to be the first Montanan to be a cabinet secretary. He sailed through his committee vote this week, picking up a number of Democratic votes in addition to unified Republican support. He now moves on to a final vote in the full Senate. We don't know exactly when that's going to be, but whenever it is, he should sail through to confirmation. Again, I would suspect with substantial Democratic support. At the end of the day, he is one of President Trump's least controversial cabinet nominees regardless of whatever issues Maria Cantwell and some other Democrats have about his position on energy development. 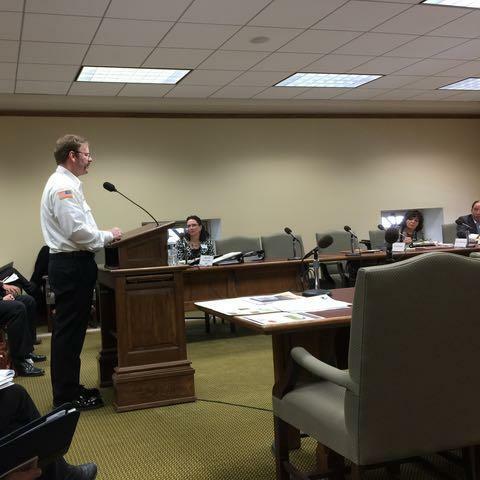 SM: Back at the Montana Legislature, budget committees this week had a steady parade of people from Health and Human Services, the judiciary and education warning of the dire consequences of budget cuts that are not just proposed, but are likely given the state's revenue shortfall. Those consequences are likely to bring some pain to some Montanans. RS: No doubt. When you put in place these kinds of cuts you just can't get around the fact that it's going to effect people. This is also at a time where we heard this week from supporters of the foster care program, from people in the judiciary, that not only are these programs not in a place to be taking cuts, but in fact they've seen caseloads increase in a way that they say, hey, we actually need a lot more resources to deal with the caseload taht we have. So, these are the tough situations you get into when you have a revenue shortfall and when there's a resistance to thinking about raising taxes even in some of the relatively modest and target ways that Governor Bullock has suggested. "There's still far too many students who are forced to work one, two or three jobs, myself included, having worked two to three jobs up until this year just to afford the cost of attendance. There are far too many students who are faced with juggling these jobs as well as a full class load so that they can graduate on time and join the Montana economy." SM: Rob, for the University of Montana making college more expensive could add to their shrinking enrollment woes. RS: Right, absolutely. I think the big picture here is that the state of Montana used to provide a great majority of the funding for its public universities. But over the course of many years, more and more of that burden has been shifted onto students through increased tuition. And this of course isn't a situation that's unique to Montana, it's happening everywhere. 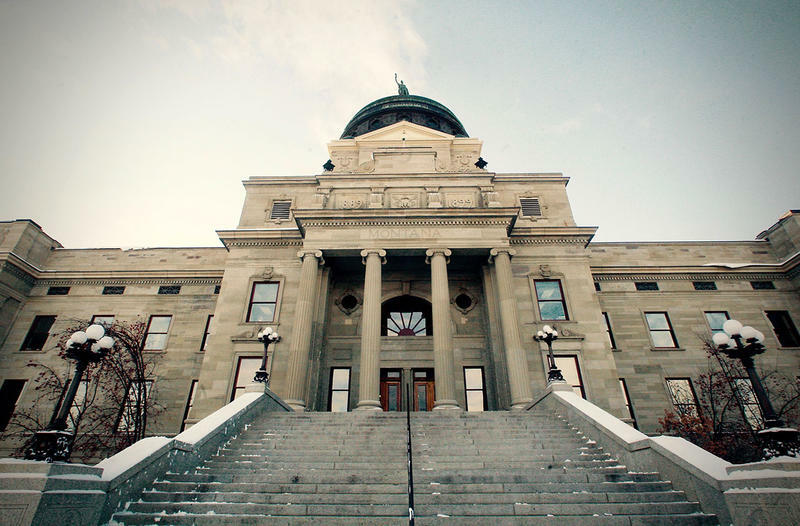 But assuming that we do see significant cuts to Montana higher education this session — which it seems to me everybody is resigned to on one level or another — it is going to mean that the University System will have to respond by increasing tuition and cutting programs and personnel to try to make up some, if not all of that difference. Now it does strike me that it's worth recognizing that compared tot he rest of the country, tuition in the Montana University System is still a bargain, but nonetheless, Montana is a poor state and even small increases in tuition can really impact students and as you mentioned prospective students. Additionally, one thing that a lot of people across the state sometimes don't fully understand, I think, is that relative to the rest of the country, Montana's universities really do operate on a shoestring budget. The larger concern here is that at some point you really do start to threaten not only access in terms of student access to pay for higher education , but you also threaten the integrity of the University System by continuing to decrease state support. SM: Finally Rob, a bill passed the state Senate this week that is known as the "Sharia law bill." And this bill would prohibit the application of foreign law in state courts. And at the bill's committee hearing, supporters expressed fear that Montana could come under Sharia law if this bill is not passed. RS: Yeah, and this is similar to measure that have been adopted in a handful of other states. According to the bill's supporters the concern here is that Islamic Sharia law could be appealed to as a legitimate defense against, for example, beating your wife. I guess if we're being generous to the supporters of the bill, we could note that there are religious exemptions that in certain cases are recognized by the courts as being legitimate, but they certainly don't extend to some of the the things that the supporters of this bill have suggested. So it seems to me to be a rather hysterical solution that's in search of a problem. I just don't see any reason to worry that Sharia law is going to supersede the Montana constitution or the U.S. constitution in the way that the bill supporters fear. And assuming I'm right on that, I suppose you could say, well this is harmless enough because it seeks to prevent something that's not going to happen anyway, But of course the opponents of the bill note that this is taking place in the larger context of, for example Donald Trump's repeated comments regarding Muslims, and his administration's immigration and refugee ban which is clearly targeted at Muslim majority nations. So basically, a bill like this is one, unnecessary, but it also creates a hostile and divisive environment. "I think this is not good for the Montana business environment. It's not good for our citizens, and it's unnecessary. Our rights are already protected," Sands said. "I urge you to vote against this bill." "This bill has been portrayed by some of the fierce opponents as being a bill that's directed at a certain group of people, it's designed just to create fear. It's really not," Fielder said. "It's a bill that offers clarity to the courts and lets them know that on this issue, which is a a growing issue in this country right now, and around the world, that here is the direction from the state Legislature." SM:It's kind of hard to make the point it's not targeted at a certain group Rob. RS: Well clearly. When you look at what the supporters of the legislation said this week, they don't even try to hide that, most of them. It just strikes me as something that shouldn't be a top-tier issue for the legislature to consider. And I suppose you could look at the economic impact, as Senator Sands mentioned. It seems to me the more compelling arguments are just that there's no reason to think this is a legitimate concern or that there's any threat of these things being put into place. SM: The bill will now go to the Republican-controlled House and if it passes there, it likely is headed to a veto by the governor regardless. 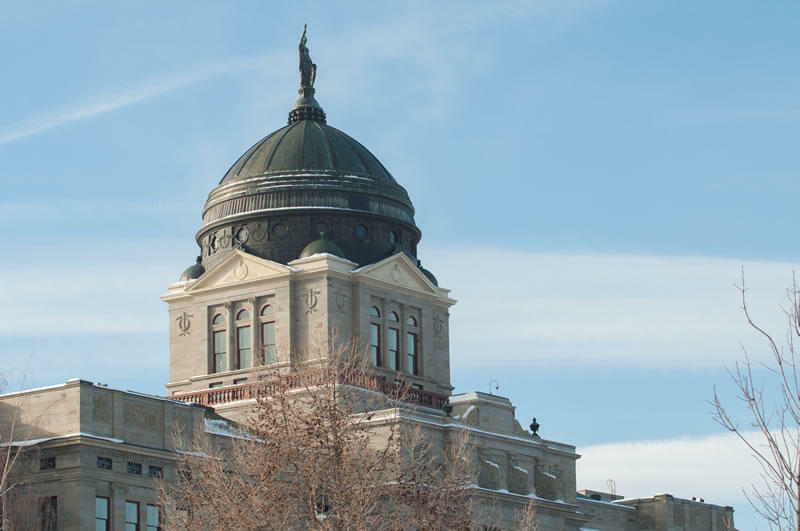 Agricultural producers and fire chiefs say they will be among those harmed by the deep cuts proposed for the service agencies that are tied to the Montana university system. 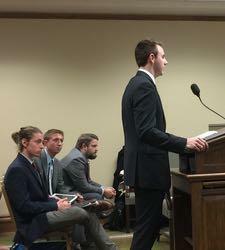 Students, campus officials, and others urged lawmakers to resist the up to $25 million budget cut proposed for the Montana University System (MUS) budget. They said it would reverse a decade of gains made to keep higher education accessible and affordable for low- and middle-income students. Commissioner of Higher Education Clayton Christian told the joint Appropriations Subcommittee on Education, officials are considering increasing tuition; cutting programs, faculty and staff; or a combination of the two. “Any of those scenarios has dramatic impacts to students,” he said.